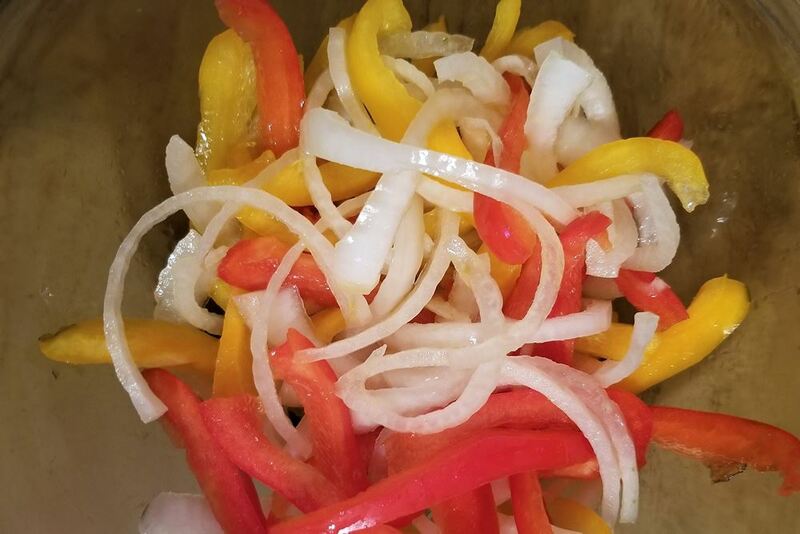 Learning how to grill peppers and onions is simple and the end result is delicious. The char adds a flavor to them that you just can’t achieve on your stove top. We often grill Italian sausages and use them as a topper. This does require a grill wok, bowl or skillet to keep them from falling through your grates. The Prep: After washing the peppers and peeling the outer layer of the onion we need to cut them into strips. If your using a grill wok or bowl you will need to cut your strips a little wider than the diameter of the holes. This will keep them from falling through when being turned. The thicker the pepper and onion strips the longer it will take to cook them. We shoot for 1/2 in wide strips. The onions can be kept in a full circle to prevent the fall through. Place the cut pepper and onion strips into a kitchen bowl. Drizzle with olive oil and add a pinch of salt and pepper (we prefer fresh ground here). Toss the peppers to ensure a nice even coating of oil and seasonings. Place your topper onto your grill, we use a mesh skillet, and heat your grill to a medium high heat. You do not need to preheat the topper but in doing so it speeds the cooking process and you get that great sizzle when tossing in your peppers. Using your tongs remove the peppers from the bowl and give a quick shake to remove any excess oil before placing onto the grill. Depending on the thickness of your peppers it will take about 10 to 15 minutes of grilling time. You should toss the peppers every 2 minutes or so. You want them down long enough to get a little char without completely burning them up. After the first 5 minutes or so the peppers will start to become soft. This is approximately the halfway point of your grilling time. We like our pepper to have some crunch left in them and we test this by eating one. 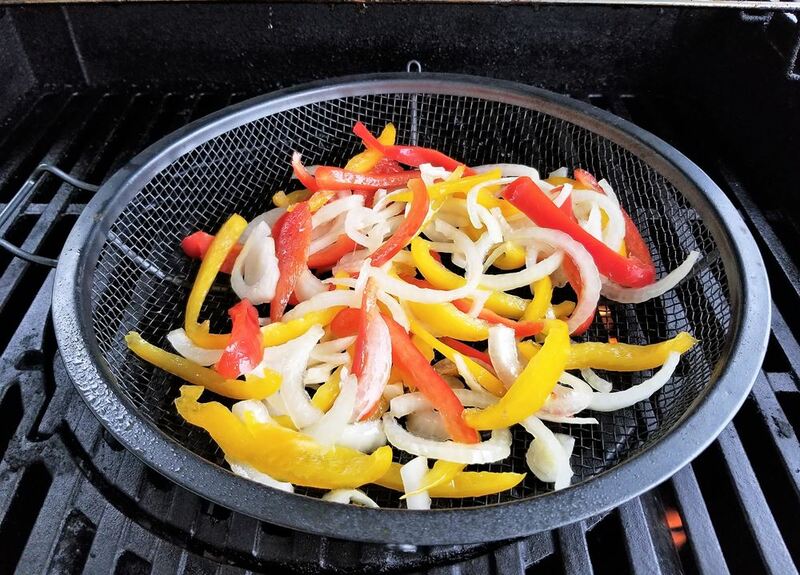 When finished we lift up our grilling skillet and pour our grilled peppers and onions directly into a serving bowl. They are a great topping when grilling Italian sausages. 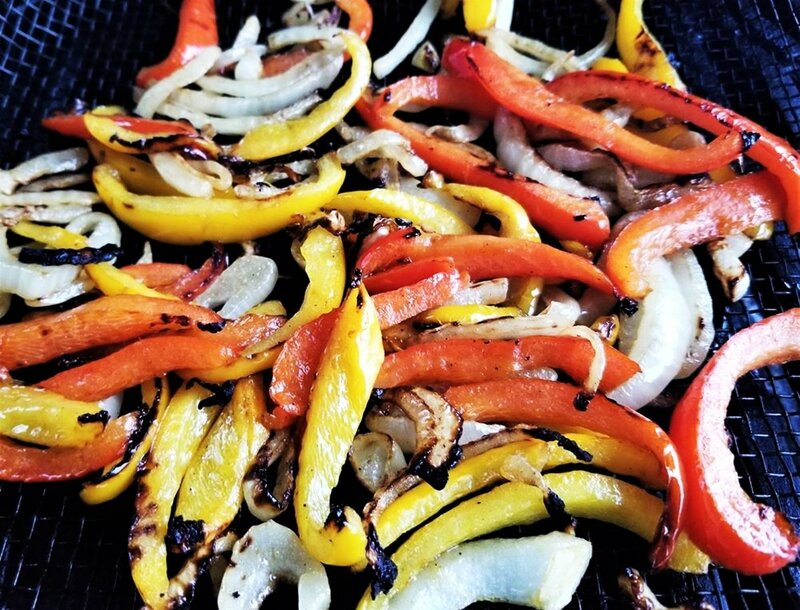 How to grill peppers and onions was written using fresh peppers and onions. You can do this with a bag of frozen peppers, it is slightly different though. Frozen peppers will become very mushy in the middle of the grilling process and then begin to firm up again at the end. It is very difficult to leave a little crunch with frozen pepper. 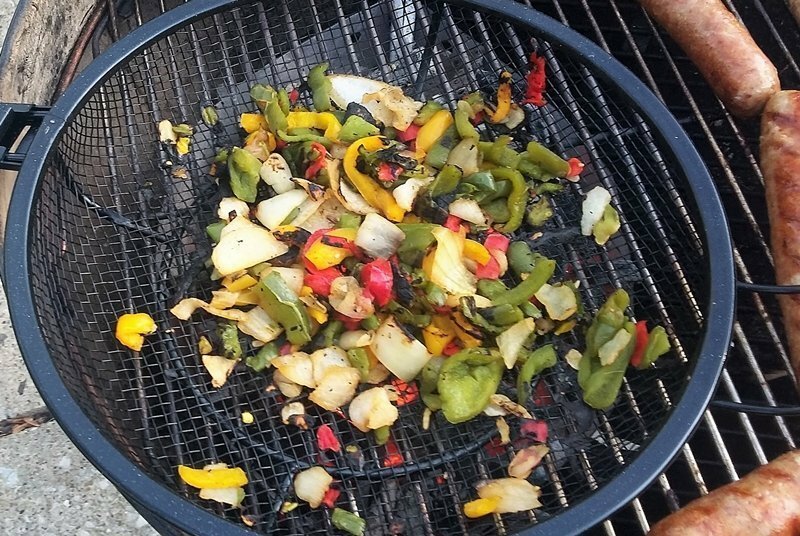 Learning how to grill peppers and onions is simple and the end result is delicious. The char adds a flavor to them that you just can't achieve on your stove top. This does require a grill wok, bowl or skillet to keep them from falling through your grates.